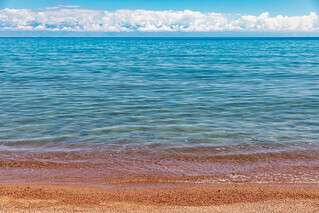 Issyk-Kul (Russian: Иссык-Куль, Issyk-Kulj) is an endorheic lake in the northern Tian Shan mountains in eastern Kyrgyzstan. It is the tenth largest lake in the world by volume (though not in surface area), and the second largest saline lake after the Caspian Sea. 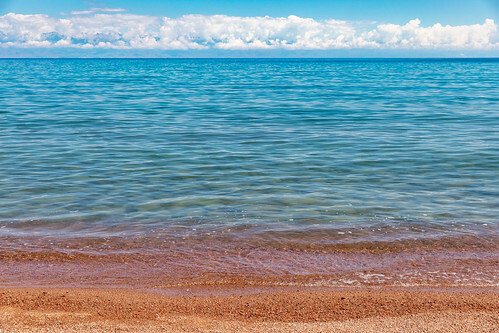 Issyk-Kul means "warm lake" in the Kyrgyz language; although it is surrounded by snow-capped peaks, it never freezes. Issyk-Kul Lake is 182 kilometres (113 mi) long, up to 60 kilometres (37 mi) wide, and its area is 6,236 square kilometres (2,408 sq mi). It is the second-largest mountain lake in the world behind Lake Titicaca in South America. It is at an altitude of 1,607 metres (5,272 ft), and reaches 668 metres (2,192 ft) in depth. About 118 rivers and streams flow into the lake.